Do you know how to make ham salad sandwiches? This sandwich might be as simple as placing sliced ham on a good quality of bread slices topped with lettuce, tomato and mayonnaise. It could also be made with your favorite ham salad recipe which is then spread thickly between two slices of bread. These sandwiches can be served for anything from lunch to crowd size parties. I usually make my favorite ham salad recipe from all beef bologna. Of all budget recipes, this makes a cheap snack or a cheap party food. If you want something more economical than the beef bologna, quite often you can find a big roll of bologna which is about 5 to 10 pounds in the grocery. I find it in Sam’s and Costco Wholesale clubs and it is cheaper. It is not all beef but works well in this ham salad recipe. This makes a great crowd size recipe for cheap party food. I learned how to make ham salad sandwiches with various recipes made with chopped ham. This is more expensive than using a bologna recipe but a great way to use up your leftover ham recipes. Because the meat is usually chopped fine or ground you can use all the remnants and little pieces of the leftovers. A long list of ingredients can be added to chopped or ground ham to add a variety of taste and texture. Sometimes not only will I grind up the leftover ham but I clean out extra things in my refrigerator to blend in the mixture. I might have a piece of onion, pieces of celery, small pieces of cheese or even a boiled egg; all this can be combined together to make a delicious salad mixture. I really like to throw in a hot banana pepper for additional flavor and spice. PARTY SANDWICH LOAF: Use any of your favorite ham salad recipes to make a party sandwich loaf. Cut loaf of sandwich bread in 4 layers horizontally. Spread ham salad between 2 layers; use two more of your favorite spreads (egg salad & cheese salad) between the other layers. Refrigerate until cold; cut sandwiches in the opposite direction and then cut them into finger sandwiches. Each finger sandwich should have some of each filling. Grind the bologna, onion, celery and pepper in a food grinder into a large bowl. Add the relish and mayonnaise. Stir until well blended. Spread a thick layer on a slice of bread and top with another slice. For parties, cut shapes from slices of bread with cookie cutters. 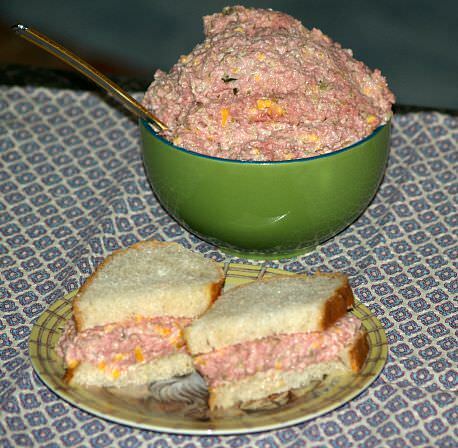 Spoon some of the ham salad between two pieces of the bread shapes. You could fill the sandwiches first and then cut with the cookie cutters but there is so much waste. I save the pieces of bread left from cutting the shapes for bread crumbs. Sometimes I dry the pieces out and use in bread pudding or stuffing. Bake pecans in shallow pan until toasted about 20 to 30 minutes; stir in butter. Combine and stir cream cheese, chopped ham, seasoning, onion, green pepper, cheese and sauce. Stir in pecans and spoon into baking dish; bake for 45 minutes until thoroughly heated. Spread on English muffins or rolls. Marinate cooked chicken in teriyaki sauce 15 minutes; drain. Combine chicken, ham, seasoned salt, parsley, celery and Swiss cheese; blend in honey mustard to taste. Place lettuce on bottom of roll and spoon salad mixture on top; top with bun half for a ham salad sandwich.